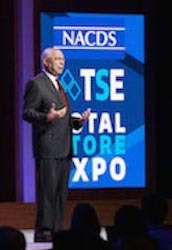 At the recent National Association of Chain Drug Stores (NACDS) Total Store Expo (TSE) in San Diego, featured speaker Gen. Colin Powell (U.S. Army, Retired) (left) emphasized philanthropy while describing highlights of his half-century of public service, including roles as National Security Advisor, Chairman of the Joint Chiefs of Staff, and Secretary of State. His lofty military and government accomplishments notwithstanding, Powell said that among his greatest joys is the youth-focused America's Promise Alliance (APA). "My real passion is young people." Powell described the genesis of APA, which was launched by all [then] living presidents in Philadelphia 20 years ago. The organization is doing well, Powell said, acknowledging the support by NACDS and other public and private entities. "This is our future, our kids," said Powell. "I cannot change anything that's in my past. I can watch the present. The only thing I can really influence is the future. The future is our children. And that's what we have to do, and make sure they are taken care of." While garnering greater support for the next generation, Powell lamented the current climate in Washington DC, asking, "Don't you remember what our founding fathers did? They disagreed with each other; they argued with each other…But they did compromise on the things they compromised on by talking to each other, by eating dinner together, by smoking cigars together, and by understanding they were there to create a constitution for a new land, and that's what they did." Seconding the inherent value of helping our fellow citizens, NACDS President & CEO Steven C. Anderson, IOM, CAE (right) spoke of pharmacy's role in benefiting society at the TSE. Specifically, he described progress on the NACDS Future Value Targeting Initiative launched at the NACDS Annual Meeting in April. Anderson said that through NACDS, members are unleashing the "power of community, conversation and solutions-focused curiosity to help address societal issues. "In the marketplace of ideas," Anderson added, "NACDS trades on our ability to develop public policy solutions. As part of Future Value Targeting, we position these solutions as the pharmacy 'Access Agenda.' It has three parts: defending pharmacy; advancing pharmacy; and serving as a responsible partner on the toughest issues facing our nation." 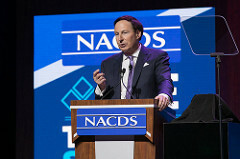 NACDS Chairman Alex Gourlay, co-chief operating officer of Walgreens Boots Alliance & president, Walgreen Co., also set a philanthropic tone at the TSE meeting. "This is where we come together to do two things: to build relationships, and most importantly to help Americans … The talk of everything is change, and I'm extremely optimistic, particularly with the heart of pharmacists at the heart of our industry … We start with the customer as the focus of the future." Gourlay noted that NACDS is developing a survey is to gather information about member chains' philanthropic efforts. "We are going to tell the story of chains more clearly," said Gourlay.